It’s hard enough as it is, choosing the perfect car seat. But, what if your baby is on the tall side? Doesn’t that automatically mean the price of the car seat will be astronomical? Well, don’t start panicking just yet. All you need is a list of the best convertible car seats for tall babies, and we’re here to help you with that. If you’re a parent, the number one priority in your life is the safety of your child. You need to know that your baby is safe at all times. We’re sure you’ve spent many hours pondering what shoes, clothes, and foods are best for your baby. The same goes for car seats. You want to take your child out with you as much as possible, and you need to know that it will be safe in the back seat. Whether you’re on a strict or flexible budget, your baby will be taken care of. And, you won’t have to worry about having a fussy baby in the back seat, since it will be perfectly comfortable in the car seat. In this article, we will provide you with a complete list of the best car seats for tall babies. We’ve filtered through all the potential candidates and narrowed it down to the top 5 choices for you to consider.With our help, your toddlers' safety and well-being are guaranteed! The first seat on our list is the Evenflo Triumph car seat. This car seat is sure to keep your baby safe at all times since it offers side-impact protection. The Evenflo Triumph car seat provides protection to rear-facing infants weighing from 5 to 40 pounds, as well as forward-facing children weighing 22 to 65 pounds. You could even say that this car seat grows alongside your child. Also, in a reclined rear-facing position, the car seat will support an infant as light as 5 pounds. However, if your child was born prematurely and is under 5 pounds, this car seat isn’t the best choice for you. The Triumph has an adjustable 5-point harness car seat for special needs. The harness will accommodate your baby’s growth. 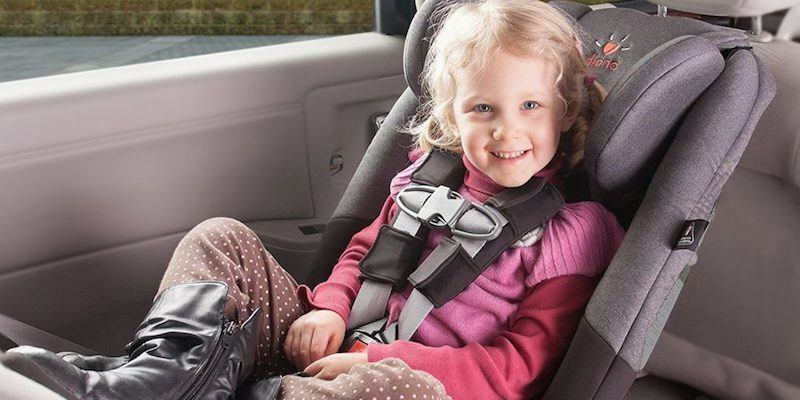 Thanks to the Quick Connector Latch System, you can safely move the convertible car seat to other vehicles. But, if you’d like a stroller-compatible car seat, you might want to consider their Evenflo Embrace car seat option, since the Triumph isn’t compatible with any strollers. This seat comes with a cup holder that’s built-in and fits all cup sizes and shapes. The cushions are machine-washable, so you don’t have to worry if your baby has an accident. You can download the user manual from their website. Additionally, if you have any questions, they regularly respond to all their emails. To summarize, the Evenflo Triumph LX Convertible Car Seat offers great comfort and protection for your baby. Next, we have another great choice to offer you. The Maxi-Cosi car seat comes with a number of great features and ensures your toddlers' safety. It has FlexTech state-of-the-art safety with multiple direction crash management, as well as Air Protect for side impact protection, designed by the top car safety experts. This car seat comes with two modes: rear-facing (9 to 40 pounds) and forward-facing (22 to 70 pounds). The rear-facing installation is very simple. Also, it has a triple position recline which helps ensure adequate positioning of your toddler. The seat pads, as well as the harness covers, are machine washable. No need to rethread the harness or take out the seat in order to clean it. The Maxi-Cosi provides a comfortable ride for your toddler, due to its premium padding and fabrics. Additionally, the fabric has a deodorizing component and draws liquid away from your baby’s skin, keeping it dry during the ride. It is easily installed, due to its latch compatibility. So, the Maxi-Cosi is a safe and affordable car seat. Its soft pad cushion seat and self-wicking fabric will keep your toddler comfortable during long car rides. It’s easy to install and uninstall. 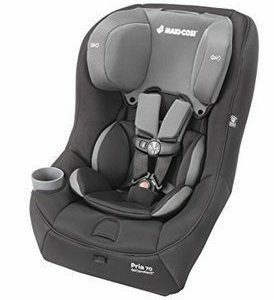 Your child is sure to love the Maxi-Cosi Pria 70 Convertible Car Seat. The Britax is among the best toddler car seats, for sure. It comes in interesting color schemes that are sure to brighten your baby’s car ride. The Britax Marathon has deep energy-absorbing shell shields as well as a steel frame that protect your child from any side impacts. The V-shaped tether helps minimize any seat rotation. Also, it has an easily adjustable harness that allows you to change the height by simply pushing a button. The car seat is accurately installed with one simple click, thanks to the ClickTight Installation System. It has seven recline positions that will ensure a comfortable ride for your toddler. Its long lifespan allows you to keep the seat through multiple children. We highly recommend the Britax Marathon. 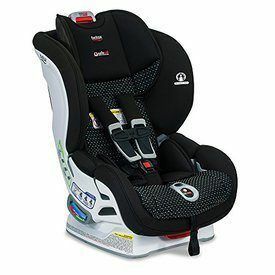 Britax builds this seat from US and global components. Also, you will have a fun range of colors and designs to choose from. How about choosing the “cowmooflage” option? Must be disassembled in order to be washed. 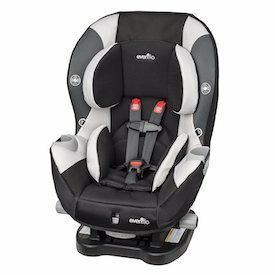 Another Evenflo safe yet budget-friendly car seat to consider is the Evenflo Sonus Convertible Car Seat. The Evenflo Sonus car seat provides protection to rear-facing infants weighing from 5 to 40 pounds, and front-facing infants 22 to 50 pounds. The highest harness slot is 18 inches, and the lowest is 6 inches. In total, the Evenflo Sonus car seat has 6 harness slots. It has a plush cover that is very comfortable and is guaranteed to keep your child comfortable during the whole car ride. A big plus is that the measurements allow the seat to fit into narrow spaces. Also, that means up to three car seats can fit comfortably in the back seat. The seat comes with dual cup holders that are removable and dishwasher friendly, so no need to worry about cleaning up juice stains. An interesting added feature is the buckle pockets. They protect your baby from hot buckle burns. All things considered, the Evenflo Sonus Convertible Car Seat is a great and affordable choice, and will surely be a great fit for your tall toddler. And don’t let the affordability fool you into thinking it’s not safe, and also very comfortable. It’s a plush seat for a great price. Finally, the best for last! The Chicco NextFit iX Zip Car Seat is our favorite car seat on the list. The Chicco NextFit iX Zip Convertible Car Seat has a nine-position leveling system that helps achieve the perfect angle in the seat of the vehicle. This car seat “grows” with your child. You can use it for seating your newborn and keep it through its preschool years. The seat includes a smooth headrest adjustment that can adjust into nine positions. It provides protection to rear-facing infants weighing from 5 to 40 pounds, as well as forward-facing children weighing 22 to 65 pounds. Chicco NextFit features an easy zip-off seat pad. It's completely machine washable. The NextFit is lined with EPS energy-absorbing foam for side impact protection. Also, In case of an accident, the car seat has a steel frame that offers extra protection. An important thing worth mentioning about this car seat is that it’s slightly bulkier than the rest of the car seats on this list. So, if you have a smaller car, maybe you should consider another car seat from our list. 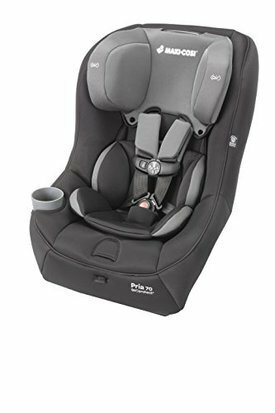 The Chicco NextFit iX Zip Convertible Car Seat is a durable car seat and will keep your baby safe and secure at all times. It’s a great choice since you can use it for many years. You won’t have to worry whether your baby is too tall, thanks to the adjustable headrest. Chicco NextFit is sure to keep your baby comfortable during car rides and will worry about keeping it safe, so you don’t have to. We consider it to be the number one choice on "the best convertible car seats for tall babies" list. Depending on your preference, you have a range of car seats to choose from. 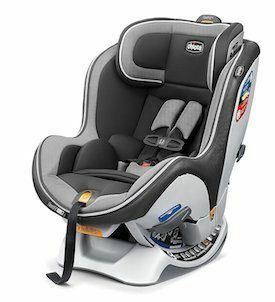 The price of the car seats ranges from $79 to $349. If you’re on a strict budget, the best choice for you would be the Evenflo Sonus or the Evenflo Triumph LX Convertible Car Seat. 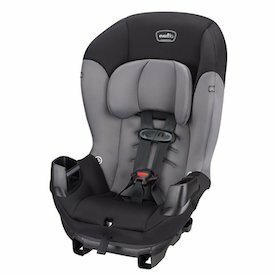 If you want a car seat that comes in a variety of colors and patterns to choose from, then the Britax Marathon ClickTight Convertible Car Seat is perfect for you. But, if you want a premium car seat for your child, look no further than the Chicco Nextfit Convertible Car Seat. It may be among the more expensive choices, but according to the best convertible car seat consumer reports, the Chicco Nextfit convertible car seat is the best toddler car seat there is. By purchasing the Chicco Nextfit, you can rest assured your baby will be happy and, above all, safe. So, trust us. The Chicco Nextfit is our top pick for the best convertible car seats for tall babies.